Darren Johnston, originally from Ontario, Canada, moved to San Francisco in 1997, where he has been living ever since. 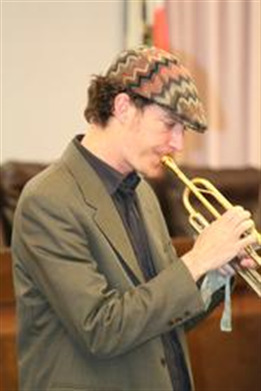 As a performer, Johnston has worked with innovative musicians and composers such as guitarist Fred Frith, clarinetist Don Byron, bassist Marcus Shelby, bassist Herbie Lewis, the ROVA Saxophone Quartet, clarinetist Ben Goldberg, and others. Inspired by his work as a sideman with Fred Frith, Johnston studied at Mills College in Oakland, CA, where he earned a Master's in composition. At Mills, Johnston studied with Frith, Chris Brown, Alvin Curran, Annie Gosfield, Joelle Leandre, and Maggie Payne. Johnston's time at Mills was instrumental not only in exposing him to the compositional techniques and music of masters from Brahms to Schoenberg, to Pauline Oliveros, but also exposed him to many improvisational techniques outside of those used in the traditional jazz canon, which in many ways have improved his abilities in traditional "straight-ahead" jazz. Johnston has received commissions to write for dance, most notably for the local San Francisco company Robert Moses's Kin, and has also been commissioned to write for the gaming company Electronic Arts, but mostly he writes for his various projects and those of others in which he participates. Johnston's own groups currently include the Darren Johnston Trio; the Empty Chamber Ensemble; the Saint-Jude Memorial Dance Band; and the eight-piece United Brassworkers Front - Johnston's longest running project.